QT-PCT-500 is used to evaluate compressive resistance of small sized packages, boxes, and containers to analyze whether specific packing can successfully withstand the compressive forces they are subjected to during storage and distribution. The test gives a clear understanding of deformation under compressive force. Packaging Compression Tester QT-PCT-500 can also used to determine compression strength of filled packages and estimate stacking criteria of for product packages and boxes to estimate the loading ability and deformation under different loading conditions to ensure the safety of product inside the box while transportation. 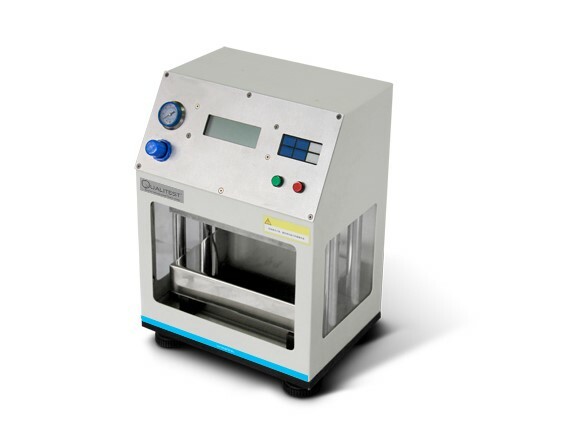 Box Compression Tester is used to determine compression strength and estimate stacking test of transport packages such as corrugated carton and honeycomb paperboard box. Over-load protection, maximum stroke protection and error alert provide a safe test operation. Light weight design and ultralow power dissipation which promotes energy saving. Fill packaging material with dummy or sample product as required making package sample; put the package between upper and lower compression boards and apply pressure to make compression test; or apply fixed load to make stacking estimates.